CTbites re-visited NOLA Oyster Bar a few months after its opening to enjoy some of the newest additions to the menu. Chef Dan Kardos is clearly in charge of the kitchen and his culinary talent is evident as he creates some of the most delicious cuisine in Fairfield County. The Seafood Tower, a dedication to cold shellfish (plus tuna), was the first course served to our table. The generous portions included Cherrystone clams, snow crab legs, Copps Island oysters, shrimp, and charred Hamachi crudo. A house made mignonette sauce accompanied the oysters. All of the items on the Tower were delightful. The crudo was marinated in white and dark balsamic vinegar plus a combination of lime and tangerine juices; it was tantalizing. The crab legs and shrimp were sweet with just a touch of seasoning to emphasize the natural flavors. The Copps Island oysters were a little bitter with very little salinity, but the addition of the mignonette sauce drastically changed the flavor profile from bitter to delicious. It is rare that I rave about a vegetable dish, but the Brussels sprouts at Nola were outstanding. Fried and then topped with a sweet maple glaze, it was almost impossible to stop eating them. Chef Kardos then added more crunch with a smattering of chopped pistachios and bacon. 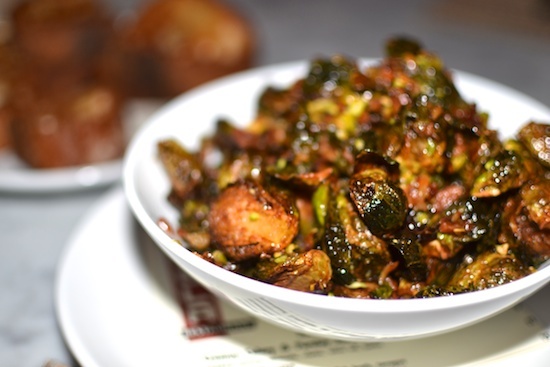 The Brussels sprouts should be a communal order to share and enjoy with everyone at the table. The “Chopped Salad” included corn, peas, beets, wax beans, Brussels sprouts and topped with grated Queso Fresco cheese. This was no ordinary green salad; it offered several vegetables from Urban Oaks with differing textures and just a touch of spiciness. It was a delicious salad. The “Cornmeal Fried Oysters” were served with collard greens, Jalapeño mayonnaise, Tasso ham and topped with a spicy corn relish. The oysters were crunchy on the exterior with a good sized belly that released the delicious liquor when bitten. The Tasso offered a smooth complement and sweet corn, pickle and red pepper relish was a perfect addition. The Jalapeño mayonnaise added just the correct level of spiciness. The “Poached Lobster & Cornbread Waffle” is one of my favorite combinations in the area. It included butter-poached lobster, griddled scallions, Queso Fresco cheese topped with a brown sauce. The waffles were sweet, crispy on the exterior and moist and soft on the interior. The lobster was full of sweet buttery flavor, the scallions brought a little bitterness and the melted cheese created smoothness to the dish. The dish was finished with one of the best brown sauces north of the French Quarter. 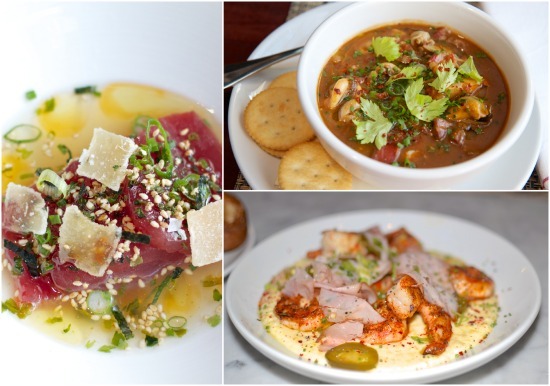 My adventure through NOLA’S seafood continued with two other outstanding dishes. 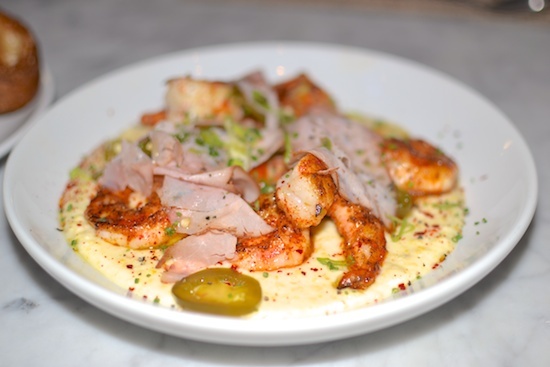 The “Shrimp & Grits” started with paprika dusted shrimp that were perfectly sautéed and paired with sliced Jalapeños to deliver a good kick. To mellow the flavors the dish contained slices of Tasso ham and all of these ingredients sat atop creamy grits. The “Griddled Scallops” were served atop a smooth and delicious celery root puree, and Chef Kardos changed the direction of a traditional scallop dish with the addition of several uncommon ingredients, strawberries and melon. The dish was further enhanced by a touch of honey, almonds, and finished with slices of speck. This was a great combination of flavors and textures. The honeydew brightened the dish and the honey brought sweetness, but I was not as excited about the strawberries. 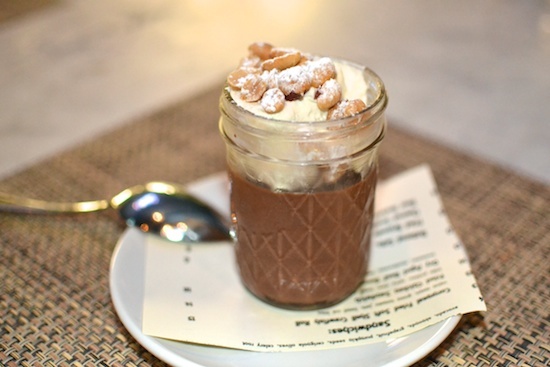 To finish the meal, I sampled the “Chocolate & Peanut Butter Pot De Crème” that was topped with whipped cream and roasted peanuts, which was much too sweet for my palate. I was less enthusiastic about this dessert. After several months, NOLA Oyster Bar has taken its position as one of the go-to restaurants in Fairfield County.